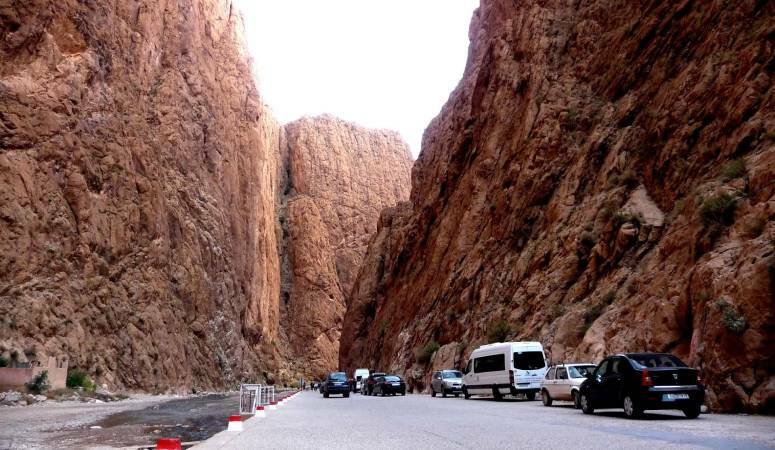 The Todra Gorge is situated in the eastern part of the magnificent Atlas Mountains of Morocco. Near the town of Tinghir, the Gorge features serene topography that showcases the limestone canyons. The gorge is spectacular with the sides rising near vertically to over 500 ft on each side of a leveled pass. Additionally, the beautiful Dades river carves out the valley, giving you a spectacular view of the crystal-clear banks. 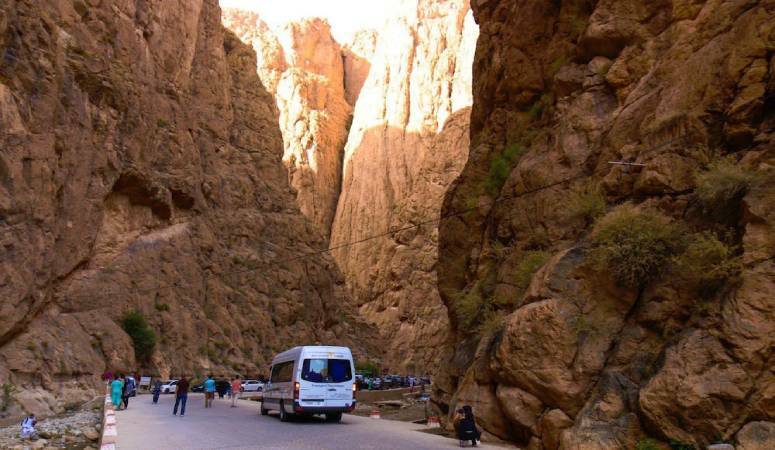 The Todra Gorge is nearly 15 kilometers away from the nearest Berber village. Your walk goes through the beautiful palmeraie of the Valley as the gorge closes around the road showcasing the grey and pink sublime rock formations. The place is most known for the different colors that fashion the landscape, giving you an experience like no other. Can we hike at Todra Gorge? If you are all about hiking through luscious landscapes, then the Todra Gorge routes are just for you. It includes many different unexplored routes. These routes comprise of shorter 30 minute walks up to 3 to 4-hour long hiking loops. One of the hiking routes is from the center of the gorge up to Tinghir via the palmeraie. This hike is expected to take anywhere between 3 to 4 hours of your time. The morning hours are the best time to hike and walk before the day starts to warm up. However, it is vital for all hikers to be extra careful and take all the necessary precautions and equipment. The winds are powerful over the canyons, and there is very little to no phone connectivity there. Make sure to carry flashlights, extra cash and whatever you might need along the way. The Todra Gorge is most known for its climbing routes. The site has recently become a favorite place for both Professional and intermediate climbers. Many routes are 25m Long that have French grade 1 to 5 bolts in the canyon and over 150 routes. In addition to this, the Pillar Du Couchant offers longers climbs, going up to 300m. One of the most popular climbing sites is the Petite Gorge, that is considered ideal for novice climbers. Moreover, since the place has grown more popular, tourists can enjoy facilities with internationally certified guides and rent out quality equipment for their climbing endeavors. 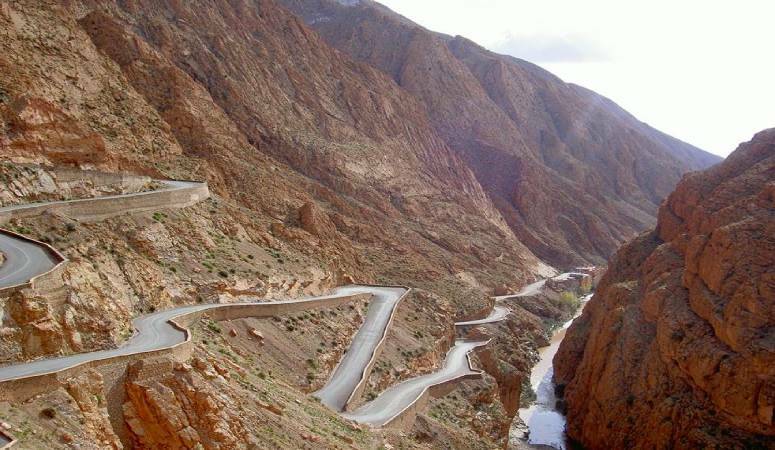 The Todra Gorges and the Dades valley are also ideal camping spots. If the weather is right, it is highly recommended to skip hotel experience and camp out near the cliff side of the Atlas Mountains. Within the 20 km of Tinghir, there is accommodation available for all visitors. If you aren’t into camping, then you also have the option of budget-friendly guesthouses and the traditionally made lodges that are also a great experience. There are different shops for you to explore the people and culture of Morocco. The area is surrounded by small eateries, cafes, and hotels. One of the most known lunch spots are near Camping le Soleil and the restaurants in the small village of Aït Baha Tizgui. The Todra Gorges is a recommended place for any traveler who is looking for an adventurous experience and wants to enjoy the beautiful topography of the area. The area offers excellent accommodation and budget-friendly tour packages for tourists around the world! The best time to visit the gorge is during the spring and autumn seasons. It Is best to go with a guide/tour to enrich your experience about the place. Be careful of some locals trying to sell you guide tours, it is best to search it and book it online. Go early in the morning to beat the crowd. Take with you sunscreen/hat/sunglasses, as well as bottles of water. For adventurous experience, you can rent a quad and explore the todra gorge, and dades valley.